Retraction: CD117 immunohistochemical expression correlates with poor outcome in vulvar melanoma [Retraction]. Lino-Silva, L., Salcedo-Hernandez, R., Isla-Ortiz, D., Meneses-Garc&iacute;a, A., Herrera-Gomez, A. (2017). Retraction: CD117 immunohistochemical expression correlates with poor outcome in vulvar melanoma [Retraction].. Iranian Journal of Pathology, (), -. Leonardo Lino-Silva; Rosa Salcedo-Hernandez; David Isla-Ortiz; Abelardo Meneses-Garc&iacute;a; Angel Herrera-Gomez. "Retraction: CD117 immunohistochemical expression correlates with poor outcome in vulvar melanoma [Retraction].". 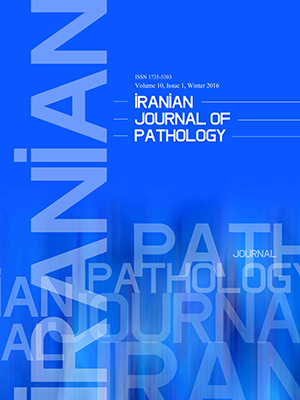 Iranian Journal of Pathology, , , 2017, -. Lino-Silva, L., Salcedo-Hernandez, R., Isla-Ortiz, D., Meneses-Garc&iacute;a, A., Herrera-Gomez, A. (2017). 'Retraction: CD117 immunohistochemical expression correlates with poor outcome in vulvar melanoma [Retraction]. ', Iranian Journal of Pathology, (), pp. -. Lino-Silva, L., Salcedo-Hernandez, R., Isla-Ortiz, D., Meneses-Garc&iacute;a, A., Herrera-Gomez, A. Retraction: CD117 immunohistochemical expression correlates with poor outcome in vulvar melanoma [Retraction].. Iranian Journal of Pathology, 2017; (): -. 2Department of Surgical Oncology, National Institute for Cancer Research, Mexico City, Mexico.